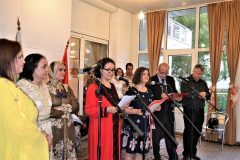 The evening of Moroccan poetry, which took place at the residence of H. E. Mrs. Zakia El Midaoui, Ambassador of the Kingdom of Morocco to Bulgaria, was in many ways an unusual event of its kind. The beautiful North African country is an increasingly popular tourist destination for the Bulgarians and provokes their interest, but Moroccan literature is not particularly familiar in this country. 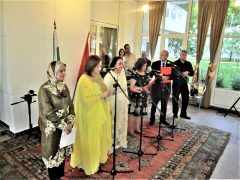 On June 1, for the first time in Bulgaria, poems from 10 Moroccan poets – five women and five men – were presented. Five of them write in Arabic, and five in French. 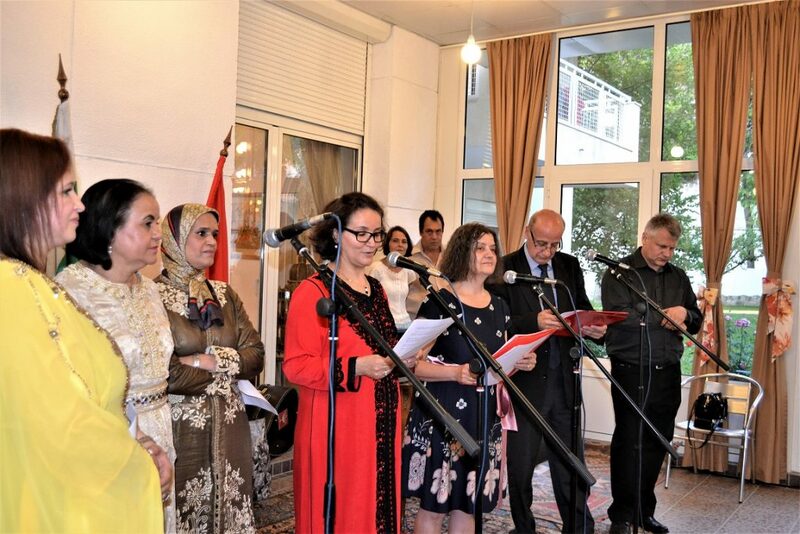 The organizers of the event were the Embassy of the Kingdom of Morocco in Sofia, the Europe and the World Foundation and the Moroccan-German Association for Culture and Integration. 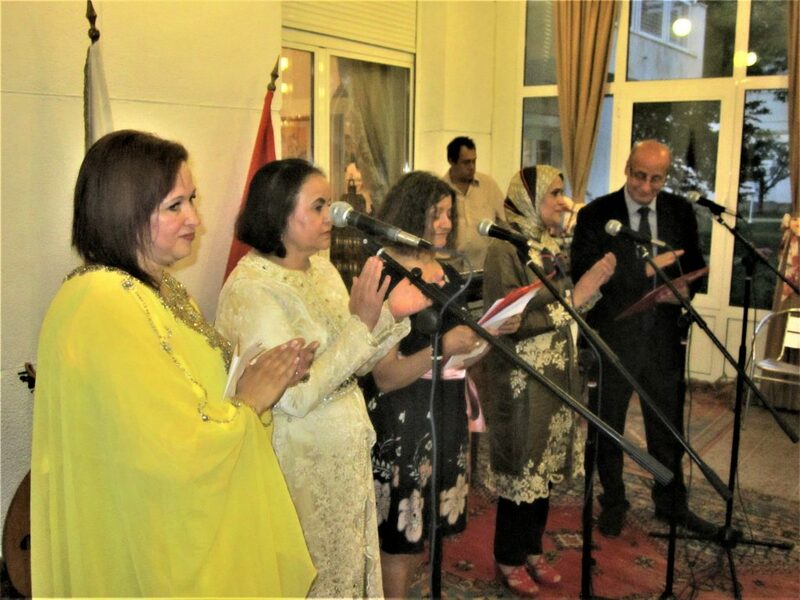 Ambassadors from Spain, the Czech Republic, Indonesia, Sudan, diplomats from the Turkish embassy, as well as artists, university professors and friends of Morocco attended. All of them could listen to literary reading and musical performances in the reception room at the residence or at the tables in the garden, which was excellently sounded. 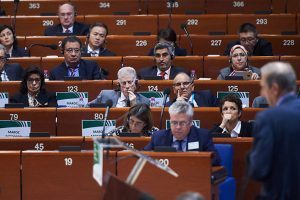 Untraditional for the official event were the working languages: Arabic, Bulgarian and French. At the beginning H.E. Mrs. Zakia El Midaoui also welcomed guests in English. 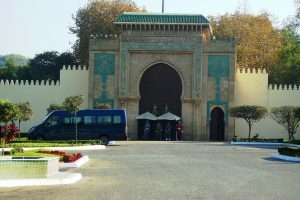 She underscored the uniqueness of this evening in the Moroccan residence, because it involved five poets. 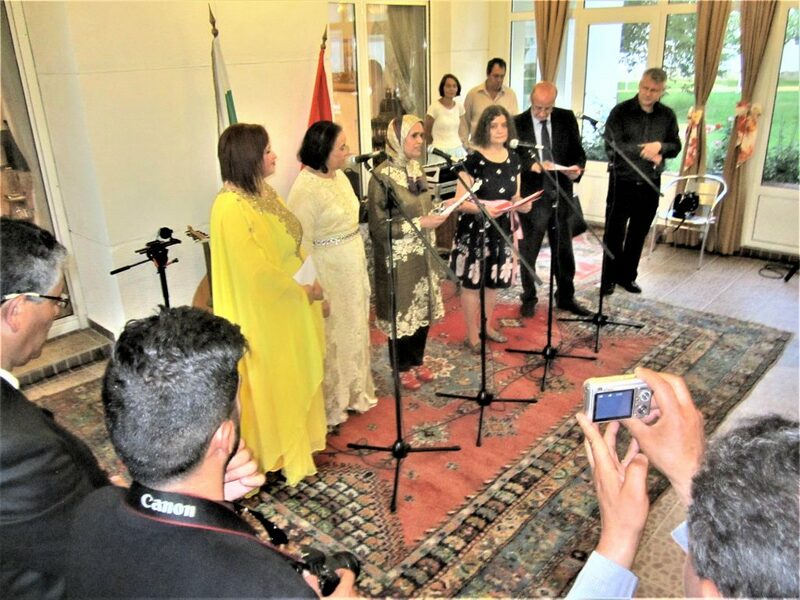 Among them were the special guests – Mrs. Nadia Yakin, a journalist who lives in Germany and is the Chairperson of the Moroccan-German Association for Culture and Integration, Mrs. Naziha Al Mountassir – a poet, artist and fashion designer who lives in Rabat, as well as the Bulgarian poet and literary critic Dr. Ivan Hristov, who participated in the International Forum of Poetry in the Moroccan city of Safi in March. The other participants in the evening were Mrs. Gergina Dvoretzka, poet and journalist, President of the Europe and the World Foundation, and Mr. Khairi Hamdan, poet, writer and translator. 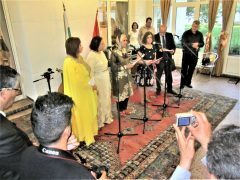 The Arabic-language poems were selected by Nadia Yakin and translated into Bulgarian by Khairi Hamdan. 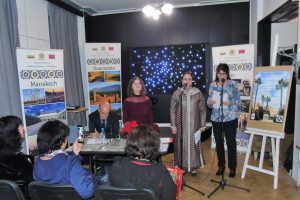 The selection of Moroccan poems written in French, as well as the translation of those works into Bulgarian, was made by Gergina Dvoretzka, who also took the role of host of the evening. 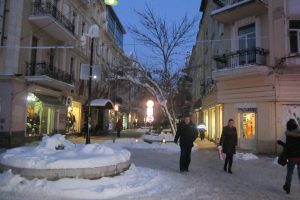 The works were read in the original and translated into Bulgarian. The evening of Moroccan poetry was opened with a poem by the poet Tahar Ben Jelloun, winner of the Goncourt Prize and a member of the Goncourt Academy. His poem Scars of the Sun was read in the original French language personally by H.E. 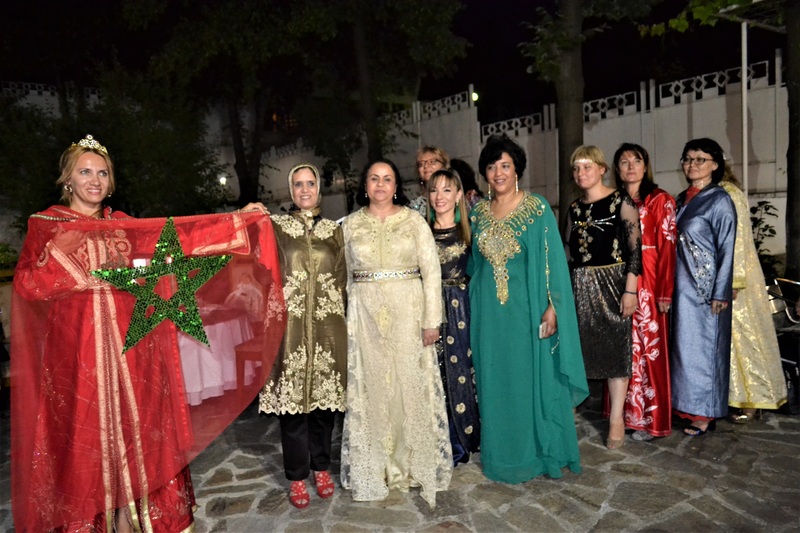 Mrs. Zakia El Midaoui, Ambassador of the Kingdom of Morocco. The literary reading continued with the two special guests Nadia Yakin and Naziha Al Mountassir, who performed one poem each in Arabic. Their translations into Bulgarian, made by Khairi Hamdan, were read by the host. Next came the presentation of the Moroccan poet Fatema Chahid. She is one of the most prominent women in the artistic and cultural sphere of her country. She is a communications consultant in Morocco and lives in Casablanca. 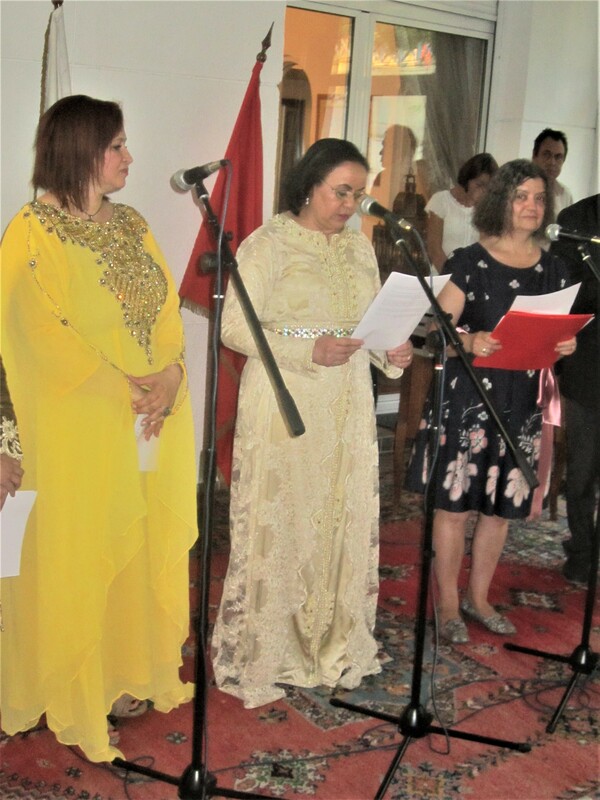 Her poem Desert Rider, written in French, was read in the original by Mrs. Malika El Haddad, Advisor at the Embassy of the Kingdom of Morocco in Sofia. Excerpts from the poem The Magician by the poet Abdulrahim al-Hassar were read by Khairi Hamdan in the Arabic original while the Bulgarian translation (made by Mr. Hamdan) was presented by the host. Abdulrahim al-Hassar is the author of four poetry collections and two books of journalism. He has won literary awards in Morocco and Italy. 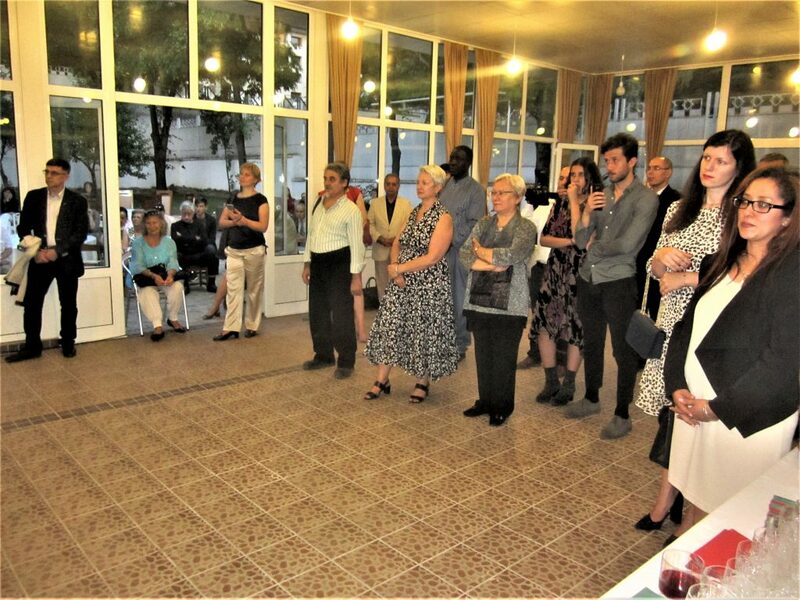 The special guest at the event Dr. Ivan Hristov, poet and literary critic, briefly spoke about his participation in the Sixth International Poetry Forum, held in March in the Moroccan city of Safi where he was the only representative from Bulgaria. 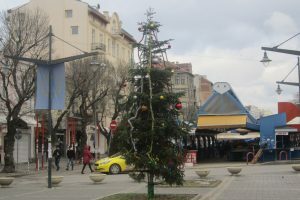 There the Bulgarian artist was awarded the Culture is a Refuge for Humanity honorary prize. He said that his impressions were extremely inspiring and that his next book would be dedicated to Morocco. 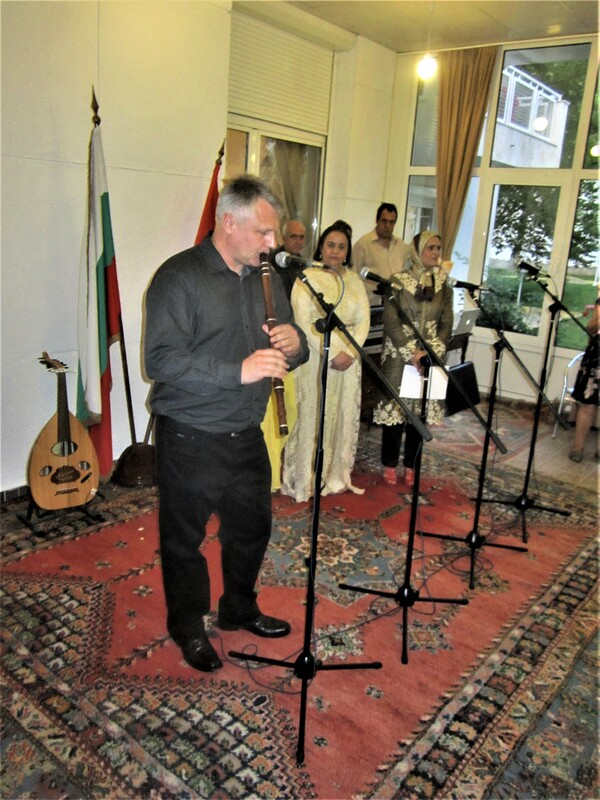 Dr. Hristov, who is also an excellent musician, performed a kaval music piece which he presented at the poetry forum in Morocco. Mr. Aisa Ikken – an artist and poet who wrote in French and combined imagination and reality in his work. He died in 2016 in Rabat, at the age of 79. Ms. Rajjah Om Sanaa – an Arabic-language poet and activist, member of the Board of the Union of Moroccan Writers, member of the World Literary Islamic Association, member of the Moroccan Human Rights Organization and other civic and literary organizations, correspondent of Arabic and Moroccan information sites. Abderrahman Ben Hamza – a French-Moroccan poet, writer and art critic, born in 1952 in Marrakech. He has published 5 books. In his poetry he combines realism and imagination. Munia al-Alali, a Moroccan poet who emigrated to Italy. 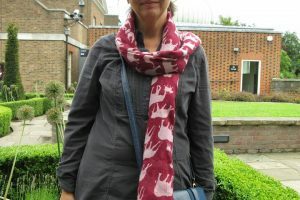 There she works as a translator. She is the President of the Organization of the New Horizon, which deals with solving the problems of the Moroccan minority in Italy. A worthy final of the Evening of Moroccan poetry was the reading of a poem by Abdelatif Laabi, a French-Moroccan translator, writer and poet, born in 1942 in Fez. In 1966, he founded the Souffles magazine, which plays a remarkable role in the cultural renewal in Morocco and the Maghreb countries. He is a winner of the Goncourt Prize for Poetry and the Francophonie Grand Prix of the French Academy in 2011 as well as a member of the Union of Moroccan Writers. The literary reading ended with the second musical performance of the poet Ivan Hristov, which earned him another applause. 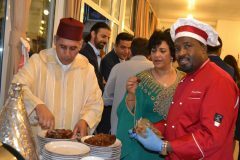 A pleasant surprise was the performance of Moroccan duet Said and Nabil, thanks to which the guests enjoyed authentic Moroccan rhythms. Said played the lute – an oriental instrument, and Nabil – a synthesizer. After that there was a fashion show of a new collection of Moroccan caftans, made by the poet and fashion designer Naziha al Mountassir. It proved that, besides in poetry, her talent also appeared in the creation of original women’s clothing combining tradition and modernity. 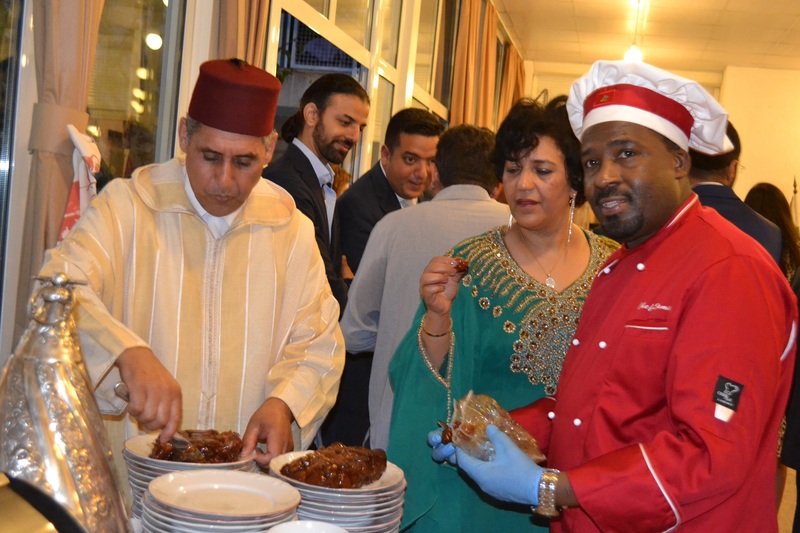 The event ended with an Iftar dinner, to which H.E. 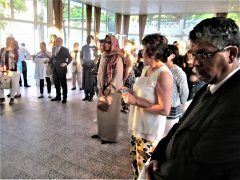 Ambassador Mrs. Zakia El Midaoui kindly invited the attendees. The photos to the left and to the right from the fashion show and the dinner were taken by the journalist Lachezar Lozanov. Many of the attendees wished to share their impressions with the host Gergina Dvoretzka. Such is also the assessment of the event of Prof. D.Phil. Alexander Fedotov, Director of the Center for Eastern Languages and Cultures at the St. Kliment Ohridski Sofia University. 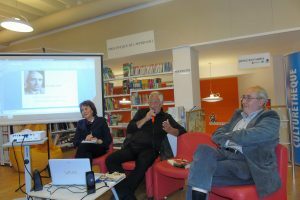 Other guests who expressed their admiration of the presented Moroccan poetry were the poet Dimitar Hristov,Vice President of the Union of Bulgarian Writers, the famous literary critic Georgi Tsankov, his wife Zoya Zaharieva-Tsankova – translator and journalist, as well as the translator Andrei Manolov, who is popular in Bulgaria with his translations of the poetry of Saint-John Perse, Léopold Sédar Senghor etc. 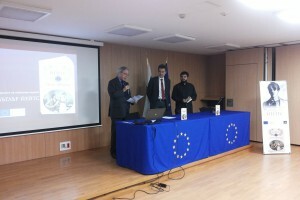 All Bulgarian translations of the verses that were read during the first Moroccan poetry evening will be published on the Europe and the World Foundation website. More photos from the event can be found on the Europe and the World Foundation page in Facebook here, here and here.